Rembrandt Harmenszoon van Rijn does not need an introduction. When you google the name Rembrandt, you get more than 37 million results and almost every result refers to the master himself; his birthplace, the streets where he lived, the city of Amsterdam, his country, museums, schools, walks, cafés and so on. Remarkably, unlike other artists, Rembrandt is primarily known by his first name. Rembrandt’s oeuvre consists of approximately three hundred oil paintings, three hundred etchings and two thousand drawings, including many landscape sceneries. But, unfortunately, he never made scenes in watercolour. Why not? The use of watercolour has a long tradition that goes back to the cave drawings of Lascaux and Altamira, approximately 15,000 B.C. Many centuries later watercolours were used by the German artist Albrecht Dürer (1471-1528) who alternately painted in oil as well as watercolour. Dürer is often regarded as the father of modern watercolours because of his refined technique; the application of thin transparent washes, the careful construction of details and the painting of the highlights with white gouache. A contemporary of Rembrandt, the Flemish artist Anthony van Dyck (1599-1641), also skillfully painted landscapes in watercolour. These were used as studies and background for his oil paintings and portraits. Rembrandt used his landscape studies mainly as inspirations for the backgrounds in his oil paintings. These were often supplemented with an Italian mountain landscape which in Rembrandt’s days was seen as the ‘ideal’ landscape. In this project I challenge myself to use Rembrandt’s landscape sketches to make watercolours as Rembrandt might have made them. With which I absolutely do not want to compare my skills to those of the master himself – it is only my personal interpretation. A word of thanks goes to Harry G. de Vries who suggested this project. My good friend Arie Jekel made a project making watercolours from Rembrandts sketches! He made wonderful watercolours from those tiny sketches! Have a look on his channels. Troubleshooting Paper Problems: When The Sizing Goes Bad. I found this blog from Karen Sioson a few years ago. She explains wonderfully why it is you have sometimes trouble with your watercolour paper. Karen is a very good artist and her specialty is flowers. I will attempt to share with you a simplified explanation of what sizing is, just enough to give you an idea why it is important to learn of it and how sizing can affect your preference for wetting your paper for stretching. We do not need to go too deep into it for our purpose. But should you wish for a more comprehensive explanation, you’ll find a lot of more technical information available online. So what is sizing? Sizing is another term for the addition of gelatine to water color paper. Gelatine makes the paper less absorbent and this is what prevents paint from just spreading on the paper uncontrollably. Picture what happens when you dab your brush loaded with water and paint on rag or tissue paper. It spreads, right? Well, the same thing would happen to paper, if it is not sized. This would help explain why there are some papers that look very nice, like handmade paper, but you can’t seem to gain any control when you try painting watercolor on them. Handmade papers for crafting projects are often unsized. Different paper manufacturers and brands offer different sizing options but generally, you can say that some gelatine sizing is incorporated into the paper pulp or mixture before it gets pressed. Additional sizing is applied as coats on the paper’s outside layers (front and back surfaces). Now why should this knowledge affect how you would wet your paper? Just this. We know sizing makes the paper less absorbent. The more sizing, the less running of paint. If you want more absorbency, you lessen the sizing. Conversely, if you want less absorbency, you keep the sizing. The presence of sizing also makes your watercolor pigments look more brilliant or intense as it keeps most of your paint on the paper’s surface. You lessen the surface sizing, you increase the permeability of the paper. With less or absent surface sizing, your colors will sink deeper into the paper and will bond more with the paper’s fibers. Some mistake this for paint disappearing or pigment bleaching (colors not so lightfast) but the paint is not really gone, it has just gone into hiding deeper among the paper fibers hence the lightening of paint applications as it dries. We wet the paper to expand the fibers and then staple or tape it while in this expanded state so the paper will have an anchor at its edges to pull on as it dries. This is what allows it to shrink flat (when you do it right) hence the term stretching your watercolor paper. Some soak the paper completely for several minutes, not just to ensure all of the fibers get wet in preparation for stretching, but also to lessen the sizing of the paper. The correct timing for the soaking takes practice. You will not want to soak it too long because sometimes the sizing have a tendency to coagulate in spots if the paper is left too long by itself. 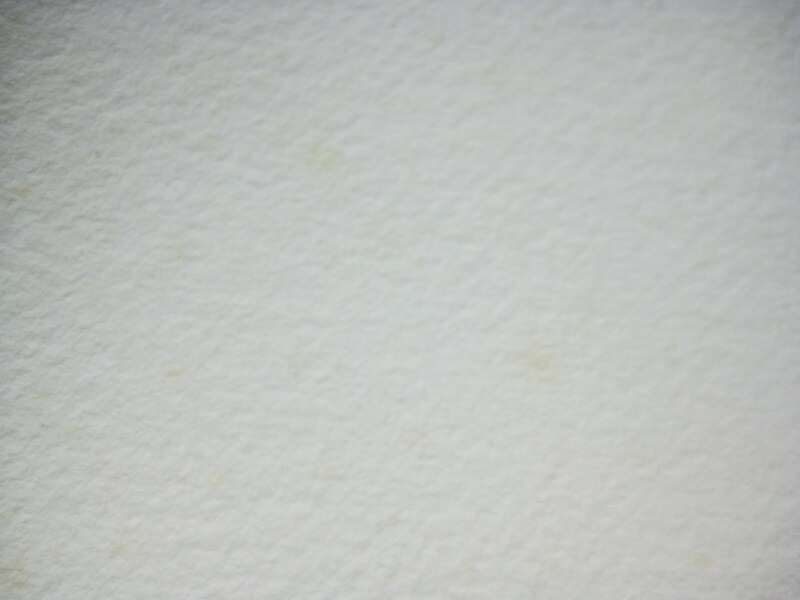 This is the reason why some may find those irregular and slightly yellowish spots on their stretched paper that do not go away when the paper dries. For some reason, these spots also wouldn’t take in color as well as the other clear areas which is why I surmised, it must be sizing. These spots will resist any color placed on it. They may ruin your painting. The too long soaking is one explanation for it. Another is that the spots may be the result of accidental drops of pure sizing as the manufacturer applies surface sizing on the paper. Accidents can happen, right? Or, you may have gotten an old stock paper with the sizing already going stale. Whatever the reason, I find that spots are less likely to happen when I wet by running water than by soaking. For the running water method, you can just put the paper under tap or running water. Make sure all surfaces get wet (front and back) and continually move the paper around. Don’t just point the water jet on one area as this may also produce the same sizing spots on your stretched paper. For bigger paper sizes, use the shower for more maneuverability. This takes less of the sizing off than what complete submersion does. Again, more sizing present, the less tendency for paint to spread uncontrollably. Your colors also will tend to be more brilliant per application as you will have most of the pigments sitting on or closer to the surface of the paper because of the sizing’s effect on permeability. But my personal choice is putting the paper under tap water and removing most of the sizing by mechanically running my hands over the surfaces of the paper. Your preference would depend on how you want your paper to behave. I like letting more pigments sink into the paper fibers. 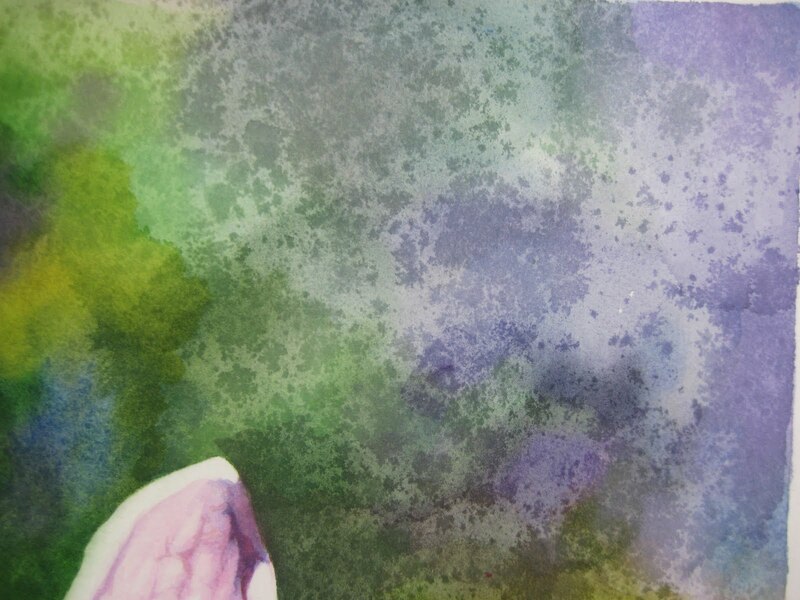 It allows me to play or take advantage of transparent watercolor layering. It also seems to add brilliance to layered colors (in my opinion and observation only), when you have more it sunk into the fibers. This method also offers the least chance for the sizing to coagulate as you let it run off the paper when you do the sweeping motion. No chance for displaced sizing to stay in one place and make spots. You have to develop a gentle touch though when you run your hand over the surfaces or you could end up agitating and damaging the top fibers. Lessening the sizing works for me because I like to blend a lot for the first part of my painting process. For detail work, which I prefer to do on the last stages of my painting, I mostly use dry brush so even with less sizing, I still maintain enough control over my paint application. By this method also, I remove mostly just the outside sizing. Remember, there is still sizing mixed in with the paper pulp or mixture itself so the sizing is not gone completely. It is possible to maintain still a lot of control with your paint application. If you want the sizing to be intact, you can always just staple the dry paper onto a board (for 140lb) or use a heavier paper to do away with stretching altogether. If you want to staple or tape in place, you can just wet the paper on top of the board with a wet sponge prior to anchoring. Take care not to agitate the surface too much with the sponge. An alternative is to use a water spritzer or mister to wet the paper so you don’t touch the surface of the paper with anything. When the paper dries, the sizing would still be there. 200 lb paper seems to be a good option to try for when you like to work on paper with intact surface sizing. Thank you very much Stan for the info. Was rummaging through my old stuff and saw this discarded painting. Perfect illustration for explaining stale sizing. I have this habit of setting aside half-finished paintings when I get that feeling that something about it is off. “Aha!” moments sometimes come when you’ve stopped obsessing over something. Sometimes it would take me days or weeks before I would get back to a particular painting. This one somehow worked its way to the bottom of my pile and I forgot all about it. Almost a year has passed since I last touched it. When I tried working on it again to finish it, spots started appearing wherever I wet the paper. Reminded me of salt effects. This one however, is caused by sizing gone bad. We have touched a bit on sizing above. But basically, the idea behind sizing or the addition of gelatine to watercolor paper during its production is to make the paper more workable with watercolor. 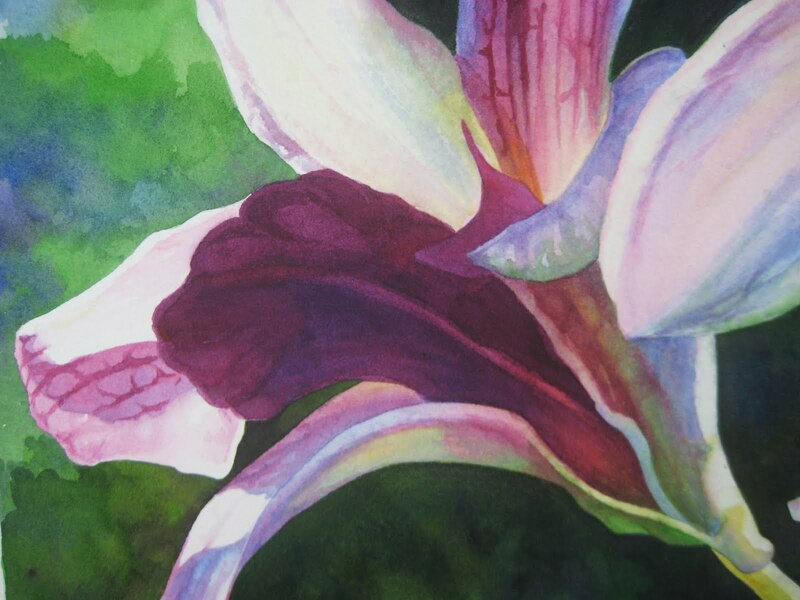 Sizing allows you better control over your watercolor as it decreases the tendency of the paper to absorb liquids and paints like tissue paper. Between the paper pulp and the gelatine, the gelatine would be the first to go stale with old stock paper. Signs of this would be the appearance of spots that don’t go away after a wash or after an application dries. Another would be when you discover areas that resist any application of paint you put down on it. There are several ways to hasten the deterioration of the sizing. As demonstrated in this ruined painting, one way is by wetting a painted watercolor that has lain undisturbed for months. You can also hasten the deterioration of new paper using the same principle. The moment you wet a watercolor paper, its sizing gets disturbed. Maybe water acts as a catalyst. This is the reason why you are advised not to stretch paper in big batches. Stretch only what you think you will be able to use within 2 or 3 months. That’s just my estimate. In our weather where heat can be more than the usual, it is always more prudent to stretch only what you think you will use. The window of usability may be different in your environment and you should let experience guide you. A sign that this was not bad paper to begin with is how the undisturbed, previously painted part is free of spots. Check the picture. You wouldn’t know that the paper’s sizing has gone bad if you do not re-wet the paper. When you find yourself itching to touch up a painting years after it is finished, remember what happened here. Not all old stock paper go bad. I use Arches cold pressed watercolor paper in rolls. One of the most economical way of buying paper is by buying it in rolls. Because you cut to size, you minimize wastage of excess paper. As long as you do not get the roll wet and observe proper storage, the paper stays usable for years. Proper storage includes storing it in its original wrapping and in the box it came in and with the crumpled paper fillers still inside. Do not put this container/box in an area prone to dampness such as near windows, bathrooms, basements. Also keep it away from direct heat or sun exposure so the paper inside does not get heat-baked. You do need to recognize what stale sizing on paper looks like, specially when you like to take advantage of art supplies on sale. Some stores put their older stocks on sale just to move the items and to make way for newer supplies. Some of these discounted paper will still be good for use but many might have sustained handling or storing damage. For this reason I prefer to spend on paper and get new stocks. You’re not really saving on money if you get bad paper. But sometimes good bargains are hard to resist so if you must, at least learn to discern the appearance of stale sizing to help you shop wiser. I wonder if you can see the very pale yellow spots. That is how spoiled sizing looks on paper that has never gotten wet. Just turned bad over time. (I keep samples of everything.) But don’t go hunting for spots where there are none. Even new paper looks a bit uneven because of how the lighting plays off against the hills and valleys of the paper. The surest way to check is to wet the paper. This is the same paper, now wet. Some new paper may have this tendency but on a very mild scale and if the paper dries without any marks, your paper is still good. There are times when you would come upon a defective batch of paper. The best way is to contact the seller and if no action there, the manufacturer to see if you can get a replacement. Might be wise for you to do a little sleuthing online to see if other buyers have been complaining about certain batches. You will have a stronger claim if your paper is from the same batch. But do not be too quick to blame the suppliers. Sometimes we may be unaware that we are doing something that harms the paper. You can artificially ruin the sizing of the paper by soaking it too long under water. Prolonged immersion may be the culprit why some sizing coagulate in spots. This used to happen to me when I was a beginner. Thinking more is always better, I would leave watercolor paper soaking for as long as 20 or 30 minutes before stretching it. The suggested submerging time is only a few minutes. Only long enough for the paper fibers to get wet. If you soak it too long, even before you staple it down, you can tell you’ve ruined the sizing by the appearance of slightly darker spots on your paper like in the sample above. Also, not all paper that develop slight spotting when wet are damaged paper. 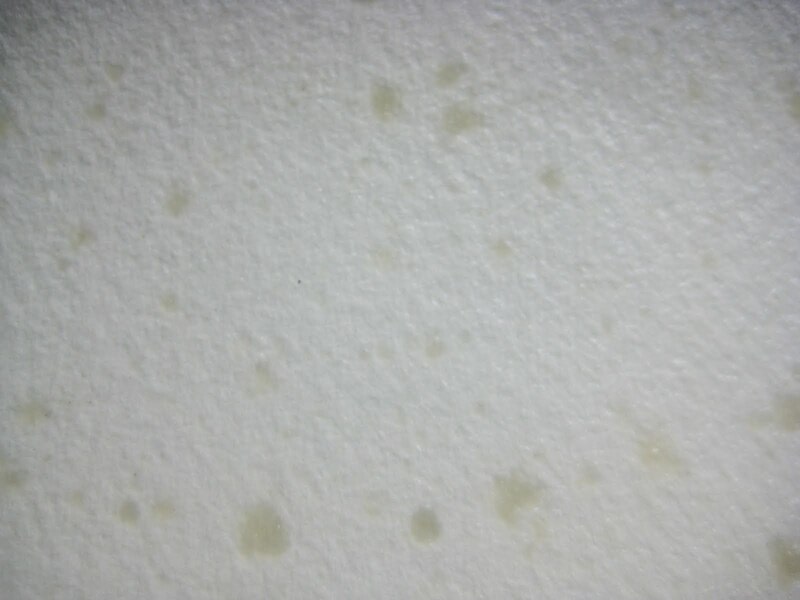 Even new and undamaged paper may develop these slightly darker spot discoloration when wet. But these would tend to disappear as the paper dries. If you can’t tell any spotting on the dried, stretched paper, your paper is good to paint on. This time of the year we all think of family and friends. What we did do and what we didn’t do and plan to do next year. Or even make new plans and set out a goal. All things I think of. And you all know I am not very busy with my posts on my website. But I plan to make a new demo from flowers in the new year. And go some deeper into colour and the use of the different pigments. I wish you all wonderful Holidays and a Blessed Christmas time. The landscape I made a photo from many years ago. You have to go in wintertime to see this because its now all green, no farm in sight from this point of view. with my Kremer pigment set. This one is on Cartridge paper that can take some water too. I decided to make the land flatter so the fence did overlap the houses so I got more unity. Also I have news, in the new year my website space will be not here anymore. You can follow me there also. I hope you all do! In the wintertime I will add you all to my new website as a follower if you did not do this yourself al ready. The reason is that my email client doesn’t support so many followers. That is… they don’t do it for free. so I need to move things! This is a Frisian landscape. I painted this before, and it thought it would be nice to make a movie from it. Hope you all like it, have fun watching. its a new thing for Google for ranking video’s on you tube. 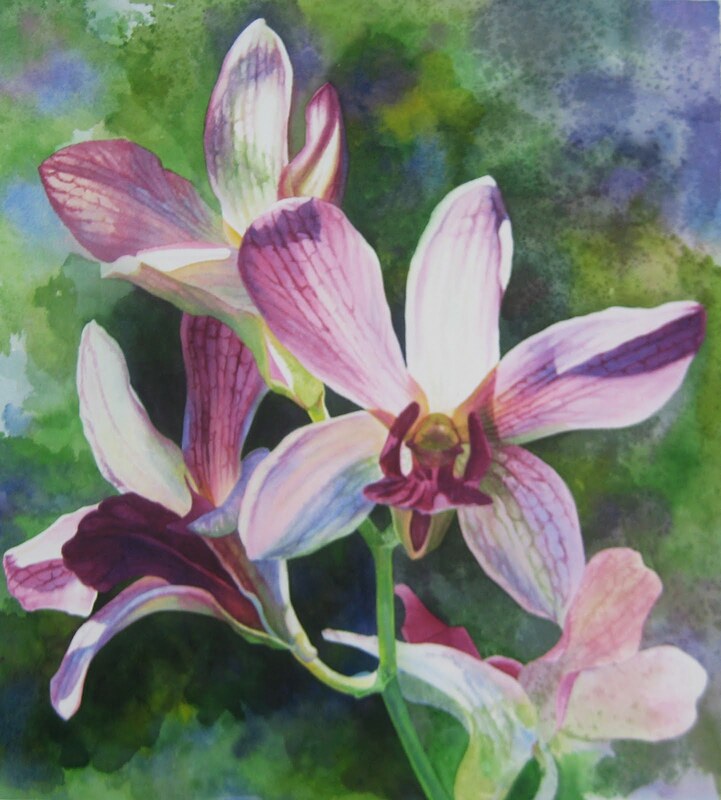 I am very honored you all subscribed to my website, I am just a hobby painter with a big heart for watercolour and everything got to do with watercolours. If you like his work check out his workshop soon in The Netherlands! Arie on the right, the smiling buying dude is me! Further I have painted a lot of landscapes, I am searching for a new method of painting, One layered paintings. It must be flawless without mistakes. So I begin with easy pictures and gradually build up the difficulties. so far so good. Here a watercolour I made from a photo from Hennie Kroezen, so nice to have friends with great sources you may barrow! She did visit the Isle of Schiermonnikoog and it was for me very inspiring to make! Also a few new videos on my You Tube Channel, if you are not subscribed to my channel please do, because I am not always post about it here. The newest video I did in Dutch, I thought when I narrate the video in English it is still okay. well maybe it is nice to watch, but all the background sound of brushes waterpots, the crackling of the paper is gone. So next time I just make one in English, or do two paintings in both languages. This is the English narrated one. My painting from the Biesbosch is also a new painting.